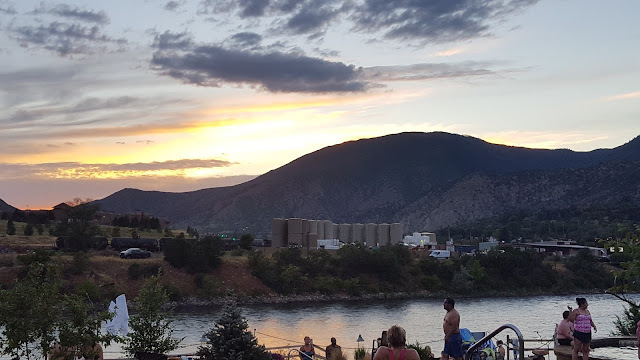 Glenwood Springs is a beautiful resort city in Colorado Rockies with many attractions like hot springs, caverns, Glenwood Canyon, Hanging Lake and Glenwood Caverns adventure park. We visited this place in summer. Glenwood Springs is also a good place for rafting and water adventures in Summer. Let me tell you about the most famous place here - Hanging Lake. 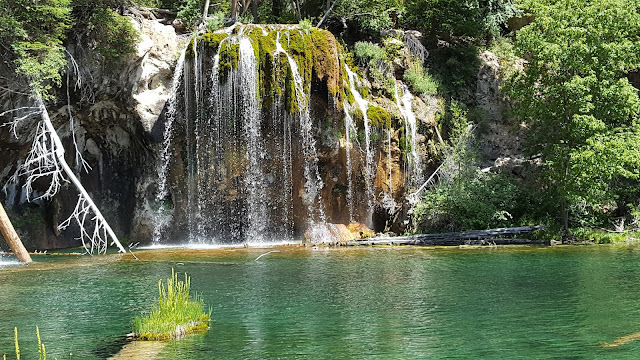 Hanging lake is designated as National Natural Landmark. It is located in Glenwood Canyon at an elevation of 7323 ft. The turquoise waters in this lake lure tourists to this difficult hike. Hanging Lake trail is 2.4 miles round trip trail with uneven paths. There are footbridges over river crossings and summer season is the best time to hike. There are steep paths and dangerous sections of the trail which need more caution. It might take 2 to 5 hrs as per our energy levels to reach the lake and return back. The amazing views on the way, the gushing creek sideways, the green lake at the end and a waterfall near the lake make the hike 100% worth. But, it is difficult to walk this trail with kids below 6 years. It is essential that we carry at least 3 bottles of water and snacks as there are no facilities at the Hanging Lake. 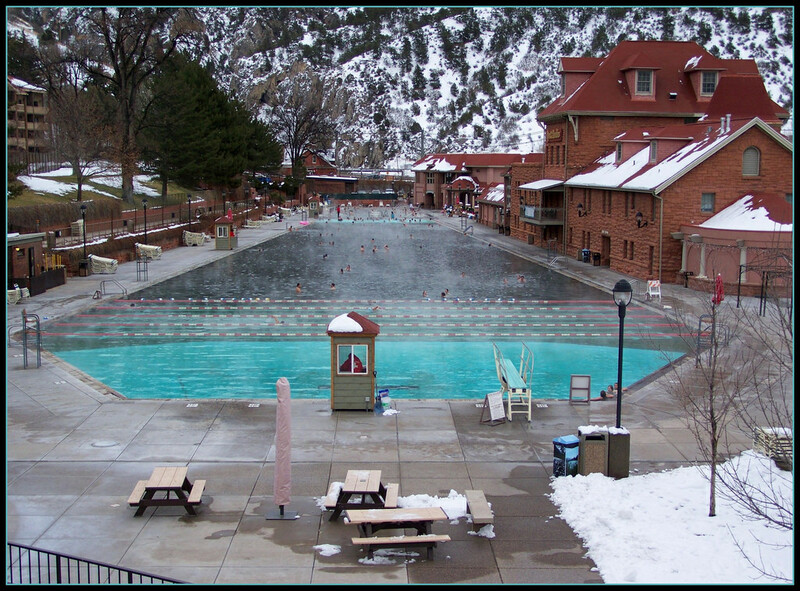 Glenwood Springs is famous for many natural mineral hot springs. There is also a place called 'Yampah spa' which is an underground vapor cave. Ute Indians used this place for healing and rituals. This place offers therapeutic steam naturally. We visited Iron Mountain Hot springs which are located alongside the Colorado River. This place has 16 natural mineral hot spring soaking pools of temperatures ranging from 99 to 108 Fahrenheit. A dip in the hot pool for even 5 mins seemed very relaxing. 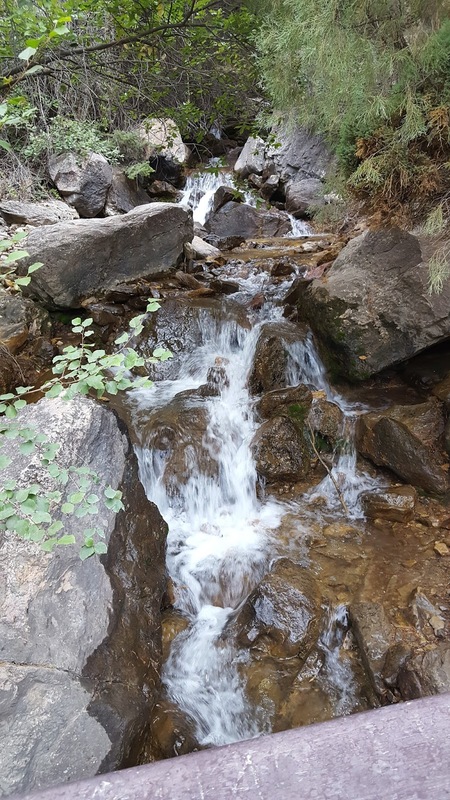 A trip to Glenwood Caverns and Glenwood cavern adventure park are also good if visiting with kids. Glenwood adventure park is the only mountain-top adventure park in North America and the alpine coaster there is Colorado's largest. Glenwood Canyon on the way to Denver is very good too. 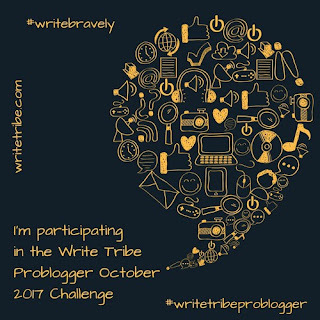 I hope, you liked this #TravelTale. Do let me know your opinion in comments. I have always wanted to visit a natural mineral hot spring. Loved your descriptions and the lovely pictures. Wow! The pictures are breathtakingly beautiful. Seems like a great place. Thank you for sharing about it. The hanging lake looks amazing! So does the waterfall! What an intriguing name - a hanging lake. Love those pictures. I can just imagine how much fun the kids would have in those waterfalls. What a an amazing place! All the pictures are so beautiful. You can’t help but fall in love with this lovely place. Thank you for sharing such gorgeous pictures and wonderful description of your travel account, Mahathi. What beautiful pics. Which camera did you use? Exactly Rashmi. Hanging lake is beautiful. In Colorado, we have many natural hot springs Sulekha. Thanks. Ya Parul. 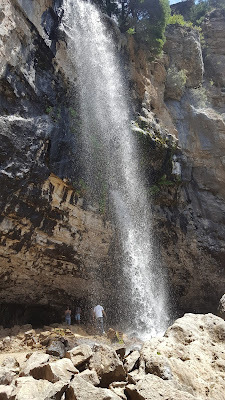 Loved the falls. Yes Tulika but the trail was too difficult for kids. Iam glad if it inspires you to travel Nupur. Traveling is refreshing to our minds.